One of world's greatest sparkling wines, Prosecco is more than just a Champagne alternative. Here's your one-stop guide to northern Italian bubbles. Prosecco hails from Northeast Italy, though its heartland is a small region in the Veneto called Conegliano Valdobbiadene. While consumers often equate it with widely available commercial-quality fizz, access to Italy’s finest sparkling wines is rising. Many retailers now sell Prosecco for every occasion, from party-ready bottlings to companions for fine dining. Production techniques continue to improve, and the appetite for experimentation grows. The result is better bubbles and diminished sugar levels that showcase terroir, quality and style. Indeed, the world of Prosecco holds much to explore for the curious wine lover. 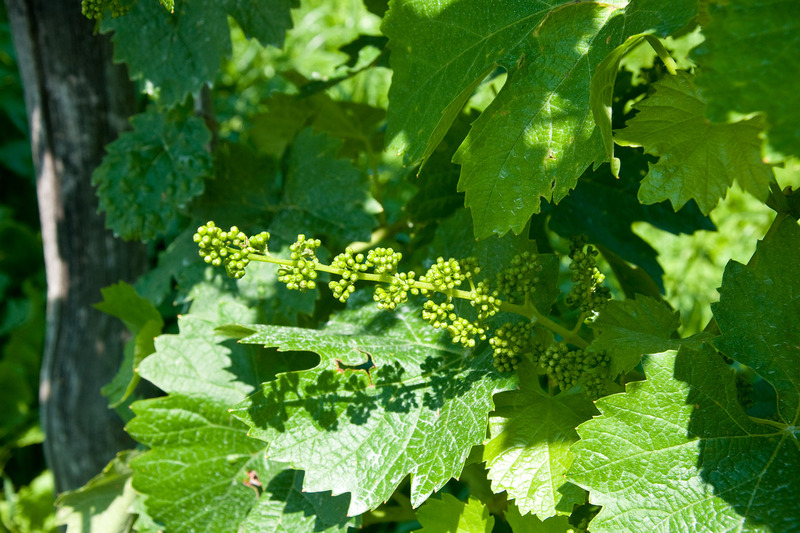 In the past, the grape used to make Prosecco was called both Prosecco and Glera. The thin-skinned green grape has been grown in the Veneto and Friuli regions of northern Italy for hundreds of years. But in 2009, an increased number of New World plantings led Italian authorities to seek legal protection for the name “Prosecco” by rechristening the variety as “Glera.” It was a move akin to how the French protect the name Champagne as a place of origin. That was also the year when Conegliano Valdobbiadene’s appellation became Italy’s 44th Denominazione di Origine Controllata e Garantita (DOCG). In Italy, Prosecco refers solely to wines made within three specific designated appellations produced with at least 85% Glera. However, producers abroad have been known to also use the term for their own bottlings, sparking legal challenges. Glera has a tendency toward high yields, and the greater the yield, the more neutral the resulting wine becomes. The grape’s moderately high acidity makes it a shoo-in for sparkling wine. It gives a lovely perfume of melons, peaches, pears and white flowers. The resulting wines are typically light to medium-bodied. Depending on the producer’s style and amount of residual sugar, alcohol levels can range from 8.5% to 12.5% for fully dry wines. A key difference between Prosecco and other sparkling wines, like Champagne, is how the bubbles are made. There are several ways to get carbon dioxide (CO2) into a bottle of wine. The most expensive and well-known technique is called the traditional method. This is how the Champenois produce their iconic sparkling wine. The winemaker fills a bottle with still, dry wine, then adds yeast and sugar before it’s sealed with a crown cap. As the yeast consumes the sugar, it gives off CO2 as a byproduct. The traditional method requires that the second fermentation occurs inside the bottle you buy off the retail shelf. However, this method also changes the wine. It adds complexity, texture and flavors like brioche and toast, especially as it ages. But not all wines should be handled this way. Some are better youthful and bright, which is why Prosecco undergoes a different process. For most Prosecco, the second fermentation happens in a large tank. There are several names for the process: Charmat-Martinotti, Italian method, tank method, cuve close in French, or autoclave in Italian. It’s cheaper, faster and less labor intensive than the traditional method. Base wine is added to a pressure tank, then a second fermentation is triggered by adding yeast and sugar. Cooling the wine when the desired atmospheres of pressure have been reached stops the rapid fermentation. This method retains Glera’s perfume and freshness. You’ve probably seen the letters DOC and DOCG on a few of your Italian wine labels. These acronyms, Denominazione d’Origine Controllata (DOC) and Denominazione d’Origine Controllata e Garantita (DOCG), represent legal quality categories established with the purpose of identifying and rewarding Italy’s great and best wines, respectively. At the base of the quality pyramid is the sizeable Prosecco DOC, which covers nine provinces in the Veneto and Friuli-Venezia Giulia. If wines are harvested, made and bottled within the provinces of Treviso and Trieste, they can be labeled Prosecco DOC Treviso or Prosecco DOC Trieste. All the Prosecco DOCs allow for more production when compared to the stringent DOCGs in the area. You’ve probably seen the letters DOC and DOCG on a few of your Italian wine labels. These acronyms represent legal quality categories established with the purpose of identifying and rewarding Italy’s great and best wines, respectively. As the pyramid narrows, the best wines in terms of character and refinement come from the Asolo Prosecco DOCG and Conegliano Valdobbiadene Prosecco Superiore DOCG. The latter also encompasses the more precise denominations of Prosecco Superiore DOCG, Superiore Rive DOCG and Valdobbiadene Superiore di Cartizze DOCG. 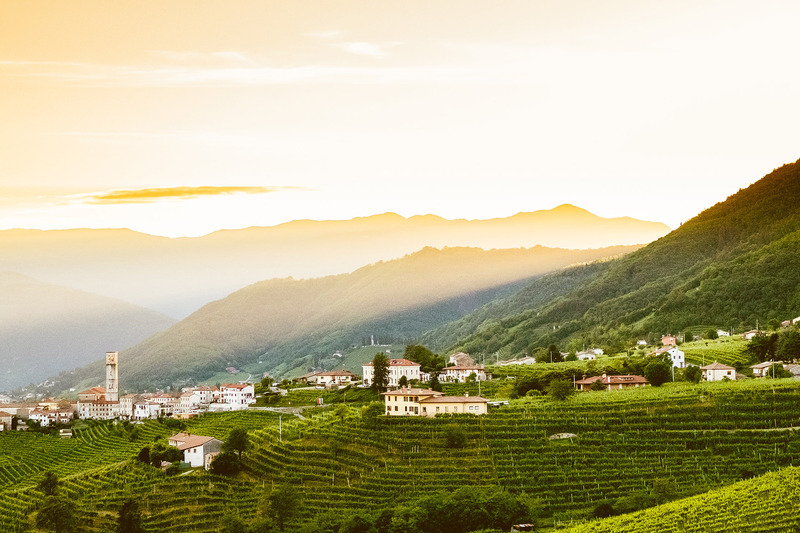 Wines labeled Conegliano Valdobbiadene Superiore Prosecco DOCG are made exclusively on the hills between the two towns of Conegliano and Valdobbiadene in the Treviso province. There, as in much of Europe, viticulture traces back to the Romans. References to the local wine and its importance to daily life are found in stone memorials, written texts and painted frescoes. Conegliano has long been considered a cultural capital. Prosecco owes its origin to the city’s— and Italy’s—first school of winemaking, The School of Oenology. Valdobbiadene lies at the heart of the production area, ensconced in lush vineyards. Superiore Rive DOCG refers to wines produced from one of the 43 designated communes or vineyard sites. These are generally the steepest vineyards and are considered the best, offering unique expressions of the different soil types and microclimates. Grapes are picked by hand, and the vintage is always added to the label. Valdobbiadene Superiore di Cartizze DOCG sits at the top, the crown jewel or grand cru of Prosecco’s ambition. Wines come from a subzone in Valdobbiadene called Cartizze, which has carried its own set of regulations since 1969. They are the highest priced, as top producers can fetch up to $75 per bottle. While these designation names are overwhelming and verbose, just remember the following: Prosecco DOC is light and quaffable; Superiore DOCGs are a cut above, with terroir-driven Rive followed by Cartizze at the top. Though some still wine is made, Prosecco is typically frizzante (fizzy) or spumante (fully sparkling). 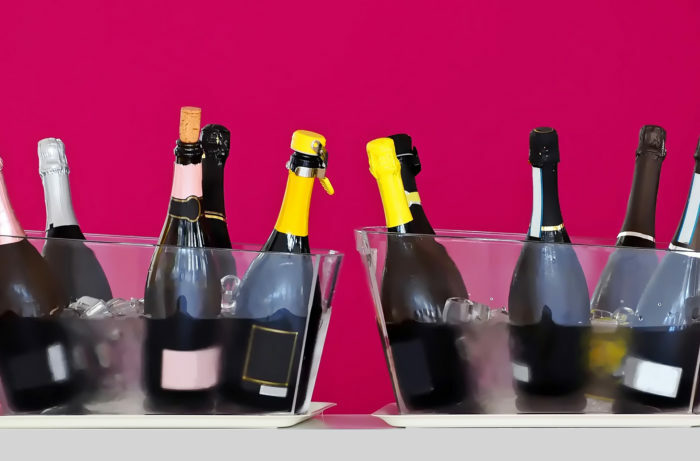 Frizzante wines have lower atmospheric pressure (1–2.5 bars) and often cost less than Prosecco Spumante (5 bars), which seek to be an affordable alternative to Champagne. As far as sweetness, Prosecco DOC comes in four levels. From driest to sweetest: Brut, Extra Dry, Dry and Demi-Sec. Superiore DOCG, however, only comes in the first three. One more style to note is Prosecco Col Fondo. For lovers of pétillant naturel (pét-nat), natural-leaning and minimal intervention wines, this frizzante style offers a different take on Prosecco. With Col Fondo, producers bottle-ferment Glera and other indigenous varieties, instead of tank ferment, then eschew disgorgement. This leaves dead yeast in the bottle (lees), which creates sediment and cloudiness. In fact, Col Fondo means “with the bottom.” The wines ferment to full dryness and can age a few years. Col Fondos are distinct, idiosyncratic and a darling of sommeliers that look for unusual wines. Does all Prosecco come from Italy? While Italian Prosecco has its roots in ancient times, the grape has long been grown in Slovenia, and more recently, Australia’s King Valley. The latter saw an influx of Italian settlers and is known for other Italian varieties like Sangiovese and Nebbiolo. Currently, Australian Prosecco is enjoying success, and its producers battle to continue use of the name for both the grape and the wine. These producers argue that Prosecco is the long-established variety name, and therefore doesn’t deserve protection. The dispute has created rancor during trade talks with the European Union. Case Paolin NV Col Fondo (Asolo Prosecco Superiore); $25, 92 points. Slightly fizzy and incredibly fragrant, this radiant sparkler boasts heady scents of honeysuckle, lemon blossom and white stone fruit. The crisp dry palate delivers green apple, Bartlett pear, citrus zest and a saline note alongside vibrant acidity and lightly foaming bubbles. Fermented in the bottle, it has some sediment at the bottom that adds flavor and complexity. T. Elenteny Imports. Editors’ Choice. –K.O. Albino Armani NV Casa Belfi Col Fondo (Prosecco); $20, 91 points. Yeasty aromas of bread dough, toasted hazelnut, pressed wild flower and an earthy whiff of brimstone follow over to the crisp palate along with citrus and yellow apple. Made with grapes cultivated according to biodynamic farming practices and fermented with wild yeasts, it’s a fascinating expression of Prosecco. Mise. –K.O. Althéa NV Dry (Prosecco Superiore di Cartizze); $24, 90 points. Citrus blossom, honeysuckle and acacia honey aromas mingle together on this off-dry silky sparkler. It’s bright, creamy and refined, doling out sweet white peach, glazed almond and candied lemon peel alongside a lively polished perlage. –K.O. Mionetto NV Luxury Dry (Prosecco Superiore di Cartizze); $35, 90 points. Aromas of ripe pear and green apple follow over to the rich creamy palate along with notes of nectarine and glazed lemon drop. Bright acidity provides freshness while a soft mousse lends finesse. Mionetto USA. –K.O.